Loomis Art Loop | Spring in the Loomis Basin – A Showcase for Art! 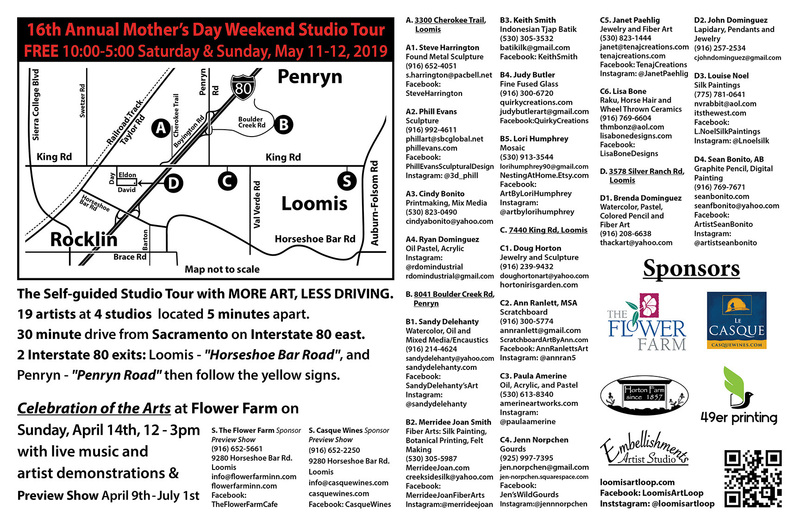 Sixteen years ago, our small group of Loomis Basin artists decided to open our studios on Mother’s Day weekend to share our art and the fantastic beauty of our area. Thus was born the “Loomis Art Loop Open Studios Tour”. We deliberately kept the number of studios small so they can all be visited in a few hours. We then invited artists working in a variety of mediums to join us at our studios so all those taking the tour can find their favorite form of art. Our goal was to create a tour where our guests spend less time in their cars and more time with the artists. There are four studios and 19 artists participating in the tour this year. The locations are within a ten minute drive of each other. Our artists have a range of professional experience, with several achieving many honors locally, nationally and internationally; some have exhibited across the USA and in Europe. Please refer to the artist profiles and web site links for more detailed descriptions of our work. So, welcome to our studios! We hope you come away inspired and eager to visit us again. Bring your family and friends, share your views on art with us and celebrate the beautiful bounty of creativity in our Loomis Basin.